I have been back to the US since last Friday and one thing that I already start missing is the yogurt. 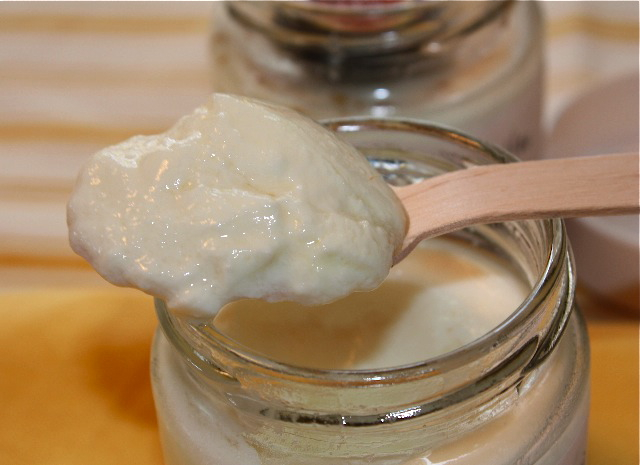 If you haven’t tried homemade yogurts, you haven’t tasted the goodness of what a real yogurt can be. I have always been nostalgic about the wonderful yogurts you can find in France in the yogurt/dairy section in any supermarket area. There are about four full aisles of yogurts and dairy specialties of dairy and non dairy fresh desserts. I am in heaven. Yogurts in the US tend to be on the boring side and quite frankly not very good. I tasted all of the brands, and I always remain faithful to Strauss, their European called yogurt. It seems like all yogurts contain gelatin and taste artificial especially the flavored ones, so I stick to the plain kind. Yogurt making is like bread making in France right now, two nationwide spread trends. So after going to FNAC, a bookstore/electronics store, and spending hours on the cook book section, I run into an intriguing book on making yogurts, and I decided to buy it. After landing in the U S of A and going through customs with half a supermarket in my suitcase, I realized that I had no yogurt maker. Yogurts can be made in many other ways if you don’t have a yogurt maker, like using a pressure cooker, an oven, etc…but I just wanted a yogurt maker and not go through a few times of failing the yogurts, like it happened before. So on day 2, I went to buy a yogurt maker and if you are a yogurt “freak” like me, it’s a good investment. In a next post, I will explain how to make yogurts without a yogurt maker, in case you don’t have one since I suspect many people don’t have one. It’s a little more tricky but it does work. I used approximately the recommended proportions I found on the book called “Yaourts” from Solar Editions, then I somehow flavored them according to my tastes. You can use any fruit you like. The great thing about making yogurt is that you can play around with different milks, spices and fruits. For this first attempt, I used fat free milk, but next time I will use the 2% fat and see the difference. The only inconvenient is that it takes about 10 hours to have your yogurts ready, but then you get seven of them. 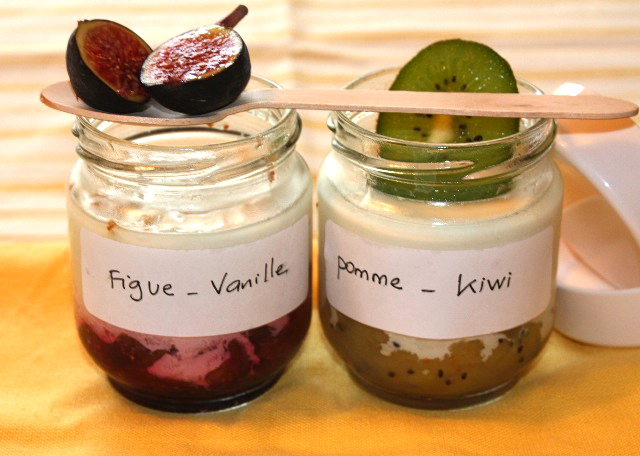 You can use either a plain yogurt or yogurt ferments for your mixture. If you are using fruits at the bottom, I suggest to start preparing them beforehand. Peel figs and cut in small cubes, add sugar and let it cook until it becomes into a smooth consistency. Add vanilla and let it cool. Proceed the same way with the apples and kiwis (without the use of vanilla). Remove milk from the refrigerator and keep it room temperature for a while. In a mixing container, mix milk and yogurt. Add evaporated milk. Mix well. Place 2 tbs of fruit sauce in each jar, add milk mixture and place in yogurt maker as per instructions. Do not close jars with lids. I kept those for 9 hours in the machine since I used non-fat milk. If you are using regular milk, or half-skimmed milk, you need to leave the yogurts about 7-8 hours. When the machine has stopped, put lids on and place in the refirgerator for 3 hours. This entry was posted by silvia on January 28, 2010 at 6:03 pm, and is filed under Desserts, Vegetarian - dairy. Follow any responses to this post through RSS 2.0.You can leave a response or trackback from your own site. Really pretty photos and it makes me drool just looking at them. I don’t have a yogurt maker so looking forward to your next post. I do agree with you. Most companies add gelatin to fruit yogurt and sometimes they’re way too sweet. 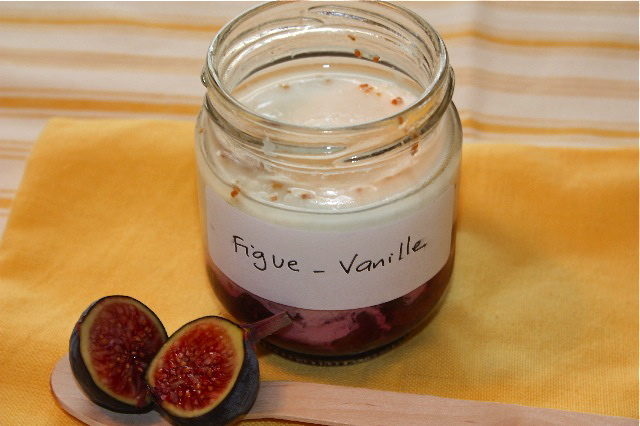 Well since I’m right here with the good stuff, I just buy my little plain pots of yogurt and add Bonne Maman fig jam. I love it! I think that a yogurt maker would be an excellent investment. I would totally get a yogurt maker, I’m with you – it’s so good. I used to buy homemade Indian yogurt in New York and it was the best, best, best stuff on earth. This looks so much better than the flavored yogurt sold at the store. We’re trying to eat foods without chemicals and food coloring, and my kids’ favorite yogurts contain both. So triste. Thanks for the recipe, we’ve never tried making our own yogurt. How do you get a thick, greek style? Welcome back! Your yogurt sounds wonderful. You are so right, American yogurt is VERY different from European yogurt. Hi Silvia. Turkish yogurt is very famous all over the world. I also make homemade yogurt. It is not difficult to make also it is healthy and delicious. We use yogurt in many cooks and recipes. I like your recipes too much. They all looks like delicious and healthy. Thanks for the recipe. J’adore le yaourt comme toi et j’ai toujours détesté le lait! Ma grand-mère faisait le yaourt à la maison et l’enveloppait dans une couverture en laine bleue; au Liban le yaourt est consommé tous les jours avec le riz ou le bulgur ou en salade; le yaourt sucré, connait pas; par contre, j’ai appris a l’apprécier en France; j’aime ta version fruitée et pas trop sucrée!